Don’t buy a pomsky from a pet store. It’s that simple. We’re asked this question a lot a “pomsky” is for sale at the local pet store for $1,000 should I buy? The answer is always no. It’s not that we have any type of personal vendetta against pet stores; pet stores serve a valuable purpose, they’re great for dog food, dog toys, etcetera… I buy my dog food and dog toys from a local pet store but it’s NOT where you want to buy your pomsky. If you’re serious about caring for a happy and healthy pomsky I urge you, work with a reputable breeder. Do not purchase a pomsky from a pet store, you will regret it and here are three reasons to back up my claim. You never quite know what you’re getting from a pet store. You don’t know the puppy’s parents meaning you don’t know the size the puppy will grow to and you don’t know the hereditary health conditions that could be passed to the pomsky. Additionally, you don’t know how the puppy was raised meaning you don’t know if the puppy has been socialized, you don’t know the puppies temperament, you don’t know if the puppy has any special needs and lastly, you don’t even know if it’s really a pomsky! 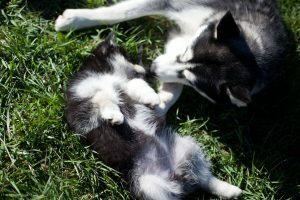 A pomsky breeder hand selects the dam and sire to breed your pomsky; pomsky breeders ensure that they breed out any health defects and abnormalities to ensure a long-term health breed. As Kanzaidy of SZ Pomskies stated “When you buy from a breeder you get to know what the parents look like, their temperaments, the puppy’s siblings, the living environment, past puppies and much much more. You will know without a doubt the puppy you are buying was raised with the best care possible and is exactly the breed you are looking for.” The pet store has no idea where the puppy came from, the pet store could care less about the parents of the pomskies and definitely does not offer any type of guarantee. As Kanzaidy followed up saying “With a breeder, you have guaranteed lineage, socialization, health testing, and many more important aspects your puppy needs in the first 8 weeks. Breeders raise their dogs in their home, handle them daily, properly test the parents for genetic abnormalities and assure you’re getting the healthiest puppy possible.” This is an important aspect of purchasing a pomsky that you just don’t get from a pet store. 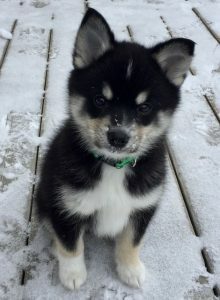 A breeder knows their pomskies; a breeder is able to assist in the development of the pomsky from birth and can perfectly match a pomsky with a compatible owner, giving both the pomsky and the owner a happy life. It’s extremely important for a pomsky to be socialized and introduced to new sights, sounds, animals and people. Socialization is a key to the development of a puppy and is vitally important to prepare a pomsky for its new home. Studies by the Journal of the American Veterinary Medical Association proved that pet store puppies exhibited greater aggression toward humans and other dogs as a result of being raised in a pet store with a lack of socialization. When asked about pet stores Kanzaidy of SZ Pomskies warned “First, you have no clue where your puppy came from. Most pet store puppies are from puppy mills. The “breeders” ship the puppies off at a very young age across the country to be crated in a glass window for kids to press their faces on. These puppy’s lack social skills, have aggression issues as well as have an array of long-term health issues as the puppies parents were not genetically screened.” Similar to the findings from the Humane Society investigation into Chicago pet stores, Kanzaidy says “Most of the time when you ask the pet store owners where the dog came from it is very hush hush. They do not provide any proof the dog is the breed they claim as well as no proof of where the dog came from.” A reputable breeder would never allow this. 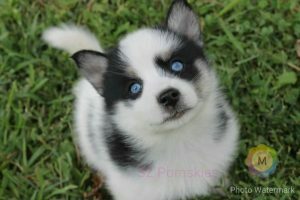 Reputable pomsky breeders are very open and helpful, a pomsky breeder will gladly invite you to visit their location and introduce you to the parents of the pomsky. It’s important that we do not support puppy mills; puppy mills detrimentally harm a breed as there is no health testing, no genetic testing and there is a general lack of care for the puppies. Rebecca and Ben of Posh Pomsky Toronto urge everyone to stop supporting puppy mills stating that “Supporting this kind of breeding makes for less happy puppies that will continue to be mass produced.” They followed this up saying “As breeders, we are striving to develop this new breed based on a foundation of physical and mental health and happiness.” Pomsky breeders work hard to perfect the pomsky breed, striving to breed out any abnormalities and potential health issues. Puppy mills are detrimental to the progress of this new breed, it is important to know with absolute certainty where your pomsky is from. Lastly, one of the most important reasons for working with a breeder, the breeder is with you for life. A pet store is there during the transaction but the second you pay, the relationship ends. 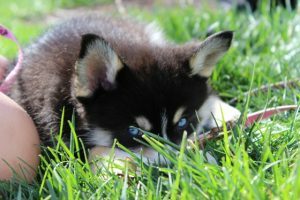 A breeder is with you for life, from the second the puppy leaves the breeder and throughout the entire life of your pomsky puppy, the breeder is there to help you. It’s important to have a good relationship with a pomsky expert. Your breeder has been there before; they’re the most knowledgeable source when it comes to raising a pomsky. Raising a pomsky is no easy task; the pomsky is a new breed with lots of energy. You’re going to need help and you’re going to have lots of questions, the breeder is with you for life to help you along the way. Chree of Mountain Shadow Pomskies touched on this subject saying “When the family has questions or is in need of some help, the breeder knows the pups and knows what to do. They help the client walk through the issues instead of giving up on the pup, the breeder has experience which can’t be brought and they have special tricks to helping.” Reputable pomsky breeders are with you along the way, the relationship does not end after they sell the pomsky. A good breeder is happy and willing to help you with any and all questions you have while raising your pomsky. It’s important to form a good relationship with your breeder because you’re going to need them again in the future. It’s also important to note that pet stores don’t offer any type of health guarantee, breed guarantee or lifetime support guarantee. Sharlee of Chinook Pomskies brought this up stating “Most pet stores don’t offer health guarantees and they are often unregistered dogs at best (puppy mill dogs at worst), there is no way to know what kinds of issues (health or temperament) will arise. Even if you are lucky and get a healthy puppy there are lots of concerns in regards to training pet store puppies.” All reputable pomsky breeders offer a health guarantee and provide proof of DNA testing to prove that your puppy is a pomsky. Breeders are with you for life. Don’t let a pet store sell to you and walk away, work with a breeder that cares for you and the wellbeing of your pomsky for life. Don’t buy a pomsky from a pet store. I stated this in the beginning and I’ll state it again. Find a reputable pomsky breeder; it’s easier than you think. The risk of purchasing a pomsky from a pet store is not worth the risk that your pomsky will be unhealthy, malnourished and chances are not even a pomsky. Find yourself reputable pomsky breeder. Don’t waste time supporting pet stores and puppy mills if you want a happy and healthy pomsky, buy from a breeder not a pet store. If you need help finding a reputable pomsky breeder, download our guide of 40+ pomsky breeders around the globe. This is list of the best pomsky breeders around the globe; each breeder has been vetted and approved by a pomsky breed club meaning these are the most reputable pomsky breeders in the world. Use this list to find a pomsky breeder near you. Special thanks to our member breeders Chinook Pomskies, Mountain Shadow Pomskies, Posh Pomsky Toronto and SZ Pomskies for insight into the pet store versus breeder debate. Our breeders know firsthand just how important it is to raise and nurture a pomsky puppy before sale. If you have any questions, please reach out to one of our member pomsky breeders.